In December 2012 a consortium led by Kevin Murray Associates – including Willie Miller Urban Design, The Burrell Company, Janet Benton Landscape (now Benton Scott-Simmons), James Fraser Tourism, ruralDimensions, WSP and Turner and Townsend – were commissioned by the National Trust for Scotland to undertake a spatial masterplan to unlock, co-ordinate and reveal the many assets that the NTS has at Brodick Castle, Country Park and Goatfell Estate. The aim of this Signature Project was to enhancing the place for the visitor and community on the island through strategic investment in both the property and operations. 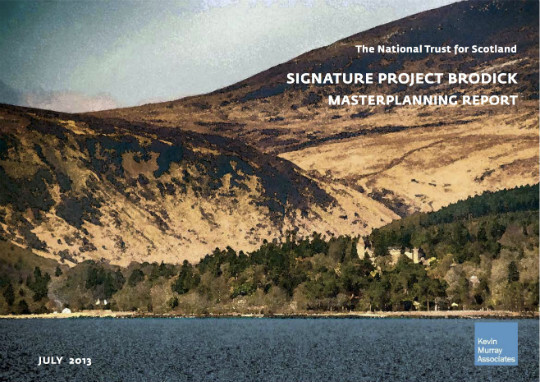 The NTS property on Arran is an iconic landscape, highly visible on the approach to the island by ferry – so delivering sensitive, yet economic solutions was placed high on the agenda. We worked with the NTS Signature Project Brodick working group, along with local community, businesses and agencies in a series of workshops. These tested different scenarios in exercises that showed the limits of both high and low levels of development in delivering the aims of the Signature Project. Too much development and change would compromise the special character of the place and its appeal to visitors, too little development and change would risk the property by not increasing visitor numbers and spend to the level required. The team analysed the spatial elements of the property from the shoreline to the top of Goatfell, the highest point on the island, and everything in between. This transect acted as a background principle for the whole project. The masterplan provided the client with a prospectus of projects that could be grouped into varying configurations to address economic, environmental and social needs of the estate and island. Conversion of the various castle flats and cottages into tourist accommodation, an extensively upgraded adventure play area for children, and a new multi-functional facility attached to the castle providing space for unified office, service and catering functions, were suggested, along with an enhanced museum and interpretation space. The aim was to build positive synergies and additional capacity that met the aspirations of the Trust for the property. The prospectus was presented to the NTS board in June 2013 where it was well received.